Opening The Fellowship of the Ring is like seeing an old friend again after years and years. I know that’s cliche, but it’s true. And I’m not gonna lie (because, you know, attempting authenticity), I’m partly blogging through this epicness because I’m an adult and I feel guilty when I read for fun now…but this is for a blog, which as we all know is of the utmost importance, so that makes it okay! Okay. Prologue: First of all, I’m normally a bad person and skip the Prologue in books, but in this case it’s definitely a good idea to read the Prologue. 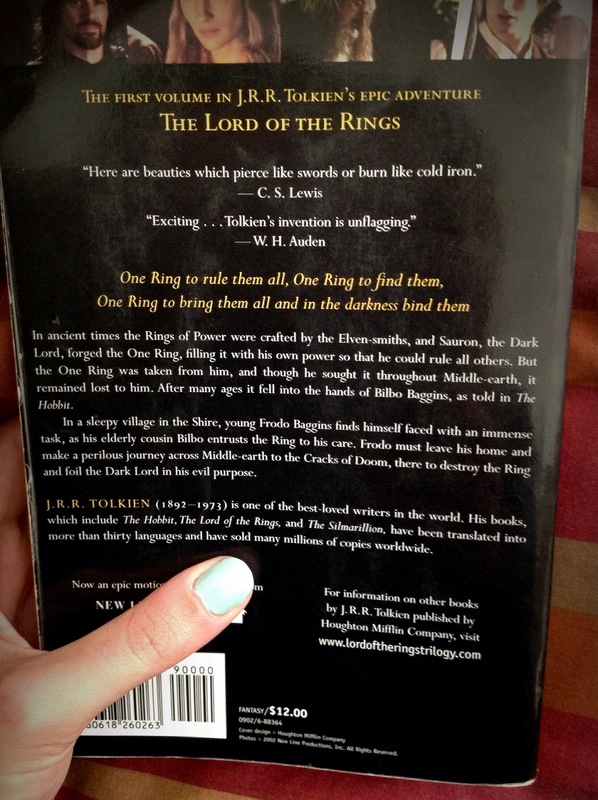 You’ll get such important information as “Concerning Hobbits” and “Concerning Pipeweed.” However, if you’re in a hurry to get to the story, at least read the fourth entry, “Of the Finding of the Ring.” It will give you context for the books you’re about to read, whether or not you’ve read The Hobbit (which is the sort of prequel to The Lord of the Rings). Chapter 1: A Long Expected Party. Enter Bilbo Baggins for his 111th birthday! It’s now 60 years after his journey with the Dwarves. He’s kind of like that jolly old uncle who you know is rich but you’re not sure just how rich he is, and he’s super eccentric, and a lot of people pretend to like him because they want his money, but actually they just think he’s weird, and you really like him because he understands you and your sense of adventure. And enter Gandalf! The Hobbits only know him as the old guy who has awesome fireworks, which suits him well, since he’s actually one of 5 powerful wizards who help watch over Middle-earth and guard against evil. And of course we have Frodo, who is Bilbo’s nephew and who lives with his uncle since his parents died when he was young. At Bilbo’s birthday party, there is a huge amount of food, drink, and dancing (in proper Hobbit style) and also Gandalf’s incredible fireworks. Tolkien wrote a whole breathtaking paragraph about the fireworks. Read about the fireworks. Everything is lighthearted. Everything is fun. Bilbo gets up to give a speech and everyone is in a good mood and thinks he’s hilarious. But then the speech takes an odd turn – and suddenly he disappears. 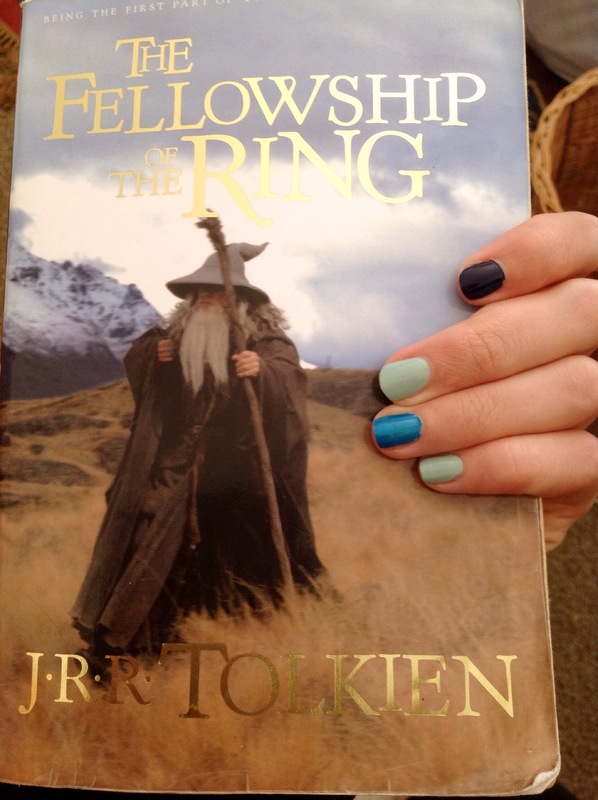 Only he and Gandalf know that he used his ring. This is where Gandalf starts to get suspicious. He knows Bilbo has a magic ring, and he knows that magic rings aren’t common. He knows the little poem I included at the beginning of the post, and he also knows that the One Ring has been missing for over 2,000 years. Of course he can’t confirm anything, but he’s definitely not at ease about how obsessed with the ring Bilbo seems to be. And there is the matter of Bilbo not seeming to age much, which is another red flag (its previous known bearer, Gollum, from whom he got the ring, is over 500 years old). We learn now that Bilbo wants to have one last grand adventure, and to finish the book he is writing about his adventurous life. He’s packing and nearly on his way out the door when Gandalf stops him and reminds him that he promised to leave the magic ring to Frodo. The conflict that occurs between them is so telling – the ring becomes its own character with its own dark presence. You get the sense that there is something very wrong here; why does Bilbo, a good-natured, easy going Hobbit, feel so strongly about a little gold ring that he even accuses his old friend of wanting to steal it? He also refers to the ring as his “precious”, which Gollum often called it, as well as other figures in history who definitely had the One Ring in their possession. I personally felt relieved when Bilbo left it behind. Yeah, yeah, I know the story, but man! You feel how free and light he becomes once he gets rid of it. Interestingly, Gandalf refuses to even touch the ring, as if he doesn’t want to have even the possibility of being affected by it. Poor Frodo finds his uncle gone, and has to deal with all the greedy relatives stealing silver spoons and what not. And enter Meriadock Brandybuck, also known as Merry, who is a clever but happy go lucky young Hobbit and one of Frodo’s close friends. He helps Frodo to ward off the crazies and get his house under control. In the midst of the humorous description of Frodo’s nasty relatives, the ring sits quietly in an envelope, and you kind of forget about it until Gandalf comes to visit after the chaos has settled. “I have merely begun to wonder about the ring, especially since last night,” Gandalf tells Frodo. “No need to worry. But if you take my advice you will use it very seldom, or not at all. At least I beg you not to use it in any way that will cause talk or rouse suspicion. I say again: keep it safe, and keep it secret!” He then says that he is leaving and that he hopes to know more when he returns, but that he will be gone for a long time. As he leaves, Frodo notes that he looks bent over, as if carrying a great weight. And that brings us to the end of Chapter 1. According to the poll in my last post, most of you are at least familiar with the movies, so I hope you’re enjoying this! One of you shattered my heart with your indifference, but you know, I probably don’t like your favorite book either, so there :D. If you’re reading along, I plan to only cover Chapter 2: The Shadow of the Past next week, because there is quite a lot of explanation of things that are crucial to understanding the story. That sentence made no sense, but I haven’t had coffee yet. Actually I have, but oh well. Come back next Monday for more LotR!